The record catalogues have been less generous with the three Schumann quartets than with anything else in the Romantic repertory. Ever since the album by the Cherubini Quartet, and despite the ardent performance of the Ysa�e, we have waited in vain for these three quartets, gathered under a single opus number, to find their saviour among the younger formations. Who was going to rediscover them? The Modigliani Quartet, the �b�ne, the Artemis? Finally it is the four talented members of the Quatuor Herm�s who have chosen them to inaugurate their collaboration with La Dolce Volta. There is no point in beating about the bush: quite simply, their interpretation is revelatory. While the musicologists agree that the Third Quartet is a masterpiece, the first two are generally played in its shadow, sacrificed on the altar of a certain formalism. But their sense of discourse bursts forth in the hands of the Herm�s, from the classical A minor quartet, in which Schumann seems to wish to sum up the golden age of the early Romantic string quartet, to the bold strokes of harmony that give the A major work its sombre colouring and its adventurous tone, by way of what constitutes in our opinion the highlight of this disc, their lyrical, one is almost tempted to say vocal reading of the Quartet in F major. Here the memory of Mendelssohn gives Schumann�s ideas wings: everything sings passionately in golden modulations which the Quatuor Herm�s underline with sensual pleasure, yet without ever forgetting the line that lies behind the polyphonic web, nor the emotion inherent in the work. It is so rare for a sound recording of a quartet � the second biggest headache for sound engineers after the solo piano � to be a genuine success that one has a duty to single it out for mention. Supported by these attentive microphones, the young musicians plunge into the complex mysteries of the Third Quartet, emphasising right from the 'Andante espressivo' the suspensions of this music in which silences and abrupt changes of mood point to the chinks in the composer�s mental armour. After receiving First Prize at the prestigious Geneva International Competition in 2011, the Herm�s Quartet won the Young Concert Artists Auditions in New York in 2012. Since then, a glittering future has beckoned. 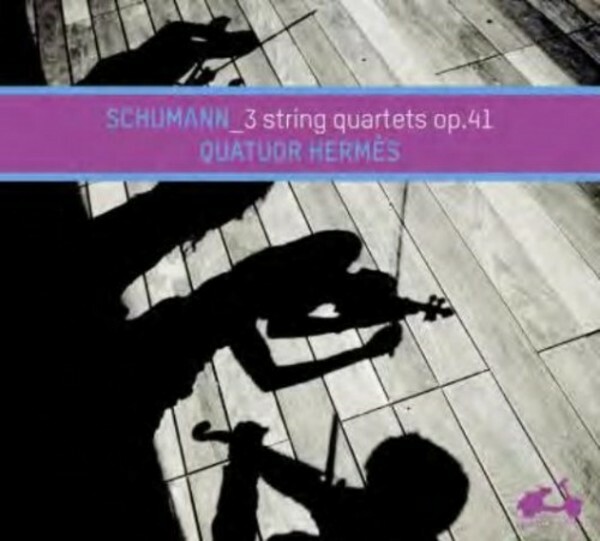 The overall impression from this luminous first encounter between Schumann and the Herm�s Quartet is one of total sincerity. Is that not the very essence of what is required to interpret the composer at his most moving?